San Diego State University has made its vision for an “innovation hub” a centerpiece of its plan to remake the Mission Valley stadium site. It envisions the region’s research and technology companies partnering with the university to fill the new campus. UCSD has struggled to fill similar space, and even some SDSU employees worry the university will have research space sitting empty. 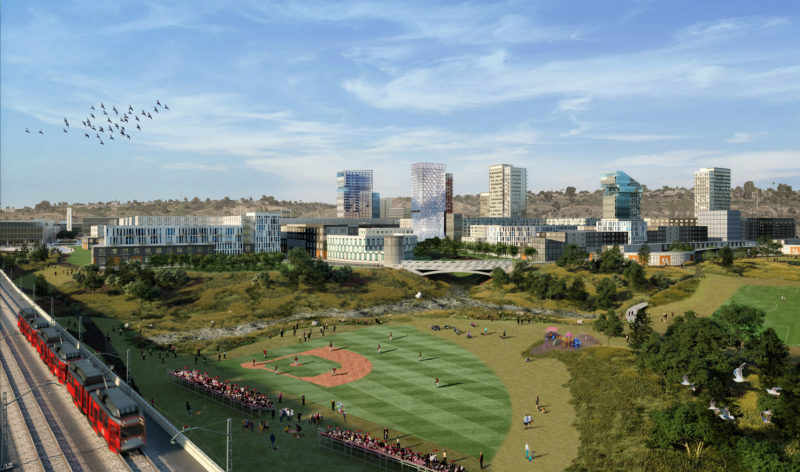 San Diego State University officials put an “innovation hub” at the center of their plans to remake the Mission Valley stadium site. They envision the region’s research and technology companies partnering with the university to fill the new campus. Two City Council members, the head of the Lincoln Club and the chair of the local Sierra Club, for example, all pointed to the hub as a powerful selling point in the plan that they said would drive jobs and opportunity in the city. The plan appears on the ballot this fall as Measure G, opposite the Soccer City plan. “This development is more than a school expansion — it will enable crucial public-private partnerships in educational research centers, developments and retail, seamlessly integrating the university into the existing community,” they wrote in a joint op-ed endorsing Measure G.
But UC San Diego’s experience trying to fill research space on its La Jolla campus, real estate trends and even some SDSU faculty members’ worries suggest that SDSU will have a harder time attracting researchers and filling the hub than Measure G’s backers are letting on. If it’s able to buy the Mission Valley land, SDSU does not have the money to pay for new research space. Instead, it plans to lease the land to partners who would build there. The university thinks that’ll be a good deal for development partners, because of the site’s proximity to SDSU’s existing campus and the access to faculty and students the university plans to offer partners, said Gina Jacobs, an assistant vice president of the university. Jacobs said the university will purchase the land, prepare it for development and select partners through standard business practices. Partners will be selected based on their ability to help meet the university’s goals. The university has yet to say what buildings will be built in Mission Valley, what research might be conducted inside and what companies might be interested in partnering to fill the site. In recent weeks, some SDSU employees have expressed concern about the university’s “build it and they will come” strategy. At an Oct. 15 forum on campus, faculty members worried that the university may end up with research space that sits empty. Gina Spidel, a biology program specialist for the SDSU Research Foundation, said she was concerned because the section of the building she works in, the Donald P. Shiley BioScience Center, was open for years before a tenure-track researcher arrived. “I don’t know how they think, if they can’t fill up this building, how they’re going to fill up space for the whole valley,” she said. SDSU also already has more than 700,000 square feet of research space: 500,000 feet of which is off campus; 200,000 is within the main campus. In a pair of mid-September interviews, Jacobs and the university’s real estate consultant, John Kratzer, CEO of JMI Realty, suggested that research being done off-campus could be moved to Mission Valley. “Some of those could potentially be relocated to the Mission Valley site,” Jacobs said. The off-campus space is located throughout the region – in Alvarado Hospital, Sky Park, City Heights, El Cajon, Escondido, Spring Valley, Kearny Mesa and San Diego. This map shows existing research space SDSU owns or leases. But many of those programs are located off campus because they serve a specific community service mission. For instance, SDSU’s center for research on sexuality and sexual health is located in Sky Park because of its affiliation with the county Institute for Behavioral and Community Health. Jacobs said the purpose of expanding into Mission Valley would be to find and create new types of research programs. She cited as possibilities environmental and water quality research, visual and performing arts venues and a lab connected to SDSU’s teacher training programs. It’s not as if there isn’t research space, though. Central San Diego, including Mission Valley, is already home to 2 million square feet of similar space that is sitting unused, according to a Voit Real Estate Services report. Plus, there are other universities in town that are trying to do similar things. UCSD is already known as the leading research institute in San Diego and it too has a lot of empty research space on its hands — in La Jolla, near where major corporate research is already happening. It, too, plans to build more. 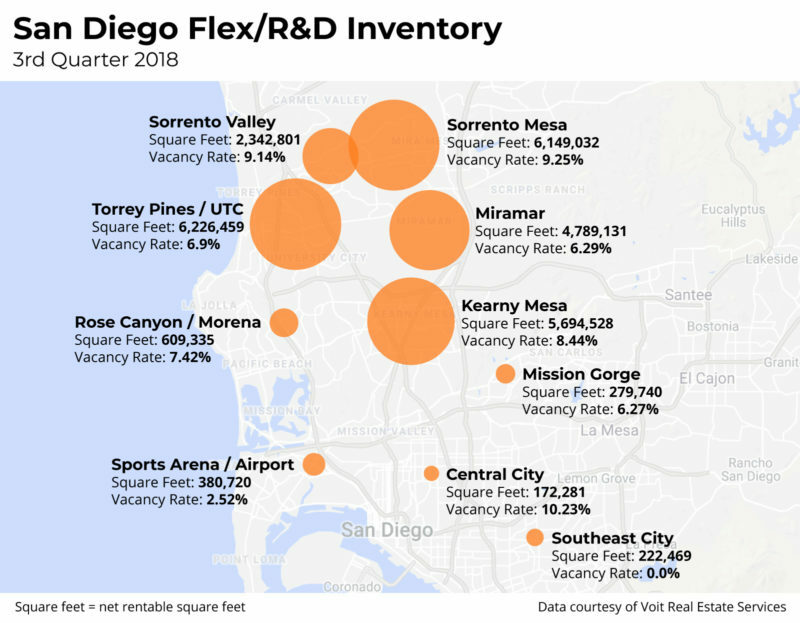 More than half of the vacant research and development space in the city – 1.21 million square feet – is located in that area, within the cluster of Torrey Pines/UTC, Sorrento Mesa and Sorrento Valley, the hotspot for companies in the biotech and life sciences industries. UCSD created 650,000 square feet of research development space a decade ago, and nearly half of that space remains empty, said Jeff Graham, UCSD’s executive director of research. Graham said the empty research space is a result of a lack of marketing. Joshua Brant, regional research director of Voit, said the available 2 million square feet of vacant research space in San Diego reflects a healthy market, and that it is hard to compare the close-knit nature of Torrey Pines near UCSD, which is a community of researchers, to Mission Valley. San Diego State will be leasing land, as opposed to move-in ready research space, for future development if the measure passes. Will Researchers Come to Mission Valley? San Diego County’s research and development property sector has seen an average of 740,000 square feet in annual growth in the past six years and 4 million square feet a year in relocations in the past 10 years, said Brant. Brant said this is what any new research hub in Mission Valley – such as SDSU West – would be looking to get a piece of, and supplement. There has been a lack of new construction in the central part of the city – including Mission Valley, Kearny Mesa and Miramar. Brant said it is unclear whether any significant number of biotech companies would choose Mission Valley, but that there is strong demand for the central part of the county. “Most of this type of real estate is getting longer in the tooth in the areas near Mission Valley,” he said. Gary London, senior principal at London Realty Group Advisors, said biotech and life sciences companies aren’t likely to consider making a home in Mission Valley without the participation and willingness of SDSU as a major partner. “The ideas of doing R&D space, I think, is a non-starter without the aggressive and committed participation of SDSU, and depends on whether SDSU is prepared to create a role in that field,” he said. SDSU has said that it will focus on interdisciplinary programming in the new district – not just the life sciences. At the faculty forum on campus earlier this month, Jacobs said the university recognizes there is already available research space in the county. “But it won’t be research space that’s partner-drafted with the university, has direct access to our students and faculty, and we can build sort of an innovation district where we’re all collaborating and working together,” she said. Kayla Jimenez is a reporter for Voice of San Diego. She writes about education, schools and children in San Diego County. Kayla can be reached at kayla.jimenez@voiceofsandiego.org or 619.550.5669.